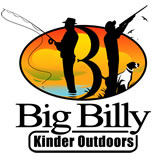 Grab your cup of coffee and join Big Billy Kinder! We invite you to come into the camp-house for outdoor talk that will get your weekend going. sure to inform and inspire.